Currently there is no full ordination officially in the Tibetan Buddhist lineages. Although there were fully ordained nuns historians do not know if the full ordination lineage ever reached remote Tibet or if the lineage came and was lost. In order to create the nunnery with all the necessary rituals and train future nuns, Khenmo Drolma was encouraged by her teachers and the nuns of Gampo Abbey to seek full ordination in Taiwan. Her account of the ordination process follows. In November 2002, due to the kindness of HH Chetsa ng Rinpoche, I received Bhiksuni Ordination in Taiwan, becoming the first Drikung Kagyu nun to take these vows. It was a step taken after much contemplation and preparation. 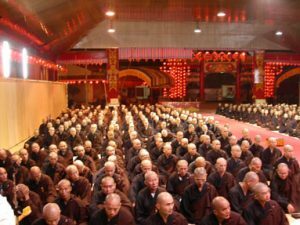 I trained as a novice at Gampo Abbey where I saw that it was difficult to maintain the required number of fully ordained monks and nuns present to hold the ceremonies that define a monastery. One winter one of the Elder nuns was sick and there was no one to lead the Sojong ceremony and she courageously left her bed to do so. I came to feel strongly that it was necessary to take full ordination so that these precious ceremonies continued unbroken at the Abbey and at our future monastery in the US. Ordinations go back from person to person to the Buddha. The women’s Bhiksuni or Gelongma lineage in Tibetan Buddhism is lost so I needed to find a monastery in Hong Kong or Taiwan, not an easy task. I began a four year journey of accumulating merit. In 2002, I found a nun in Taiwan to assist me in getting an application. When it arrived I was working at HH. Chetsang’s Library in India where friends could read the application and fill it out for me as it was all in Chinese. HH. Chetsang Rinpoche both supported in every way and removed all obstacles, offering me a plane ticket and the resources of his centers in Taiwan to help me travel. I arrived in Kaoshang Taiwan with 500 candidates at the Ji Yu Chan Monastery to be ordained during 5 intense weeks of training and practice. It was a triple platform ceremony, which means we retook novice vows, then Bhiksunni and finally a special Bodhisattva vow only given to monks and nuns. They brought in their most outstanding teachers for our classes and in addition there were about 30 training/disciplinarian monks and nuns watching and correcting our every move. I was one of 5 foreigners and one of three who could not speak any Chinese. We began our studies with the first teacher holding up a book and announcing that it would be memorized. (I mistakenly thought foreigners might be excused from this!) By the next morning w e were assembled in teams organized by height, so that the sea of people in the prayer hall had a beautiful shape. Our teams rotated serving food and daily cleaning the monastery with crisp efficiency. In the next few days we were trained how to wear the robes, sit, stand, prostrate and eat with perfect form and dignity. Which is to say I can now stand still without moving at all (In the first few weeks all of us had swollen feet and ankles) and eat with Chinese manners in several different rituals. We were instructed to come with 3 kinds of robes. In addition to work robes we had three kinds of “zens” which had particular elaborate ways to put them on and off, and fold them not unlike origami. Even the prayer mats had three ways to fold and unfold them! And all instructions were of course in Chinese! I would draw little maps and then make up a phonetic version of the commands for each folding in order to memorize them. I knew the words for” three prostrations” in my sleep. The foreigners were in a team together as we were tall, for the same reason we were first putting us always on the spot. It became a nuns “outward bound” as each of us had different skills. Those who spoke Chinese stood beside those who did not and translated simultaneously. Two German nuns brought songbooks of the daily rituals in phonetic Chinese and a translation of the ceremonies. During classes one nun took notes on a computer in English and we read over her shoulder and studied the notes of others during “rest time”. As we progressed through the arduous daily schedule from 4 am to 10 pm, we supported and helped each other. Most of the Taiwanese were about twenty years old but for those of us in our 50’s it pushed the limits of our physical capacity. 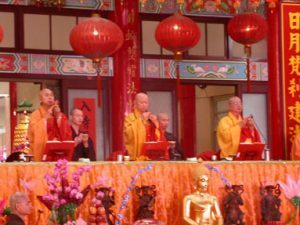 I found the daily memorizing of prayers and rituals in Chinese one of the most difficult intellectual stretches I had encountered in a long time. For each ordination we first studied the ritual and immediately after trained in the vows we had just taken. The Shramanerica and Bodhisattva ordinations were done as an assembly. The Bhiku/Bhiksunni ordination lasted four days because all the candidates go before the Sangha in groups of four and there were 500 of us. The assembly to be ordained sings invitations to the Buddhas and Bodhisattvas and then to the ordaining masters. Then in large groups we were questioned to see if we are worthy candidates. We women were brought in groups of four candidates first to the Nuns Sangha of twenty august Abbesses to be questioned again and then ordained. Next we were taken to the Sangha of Abbots where the ceremony was repeated. In the days of preparation I was aware of wanting as a foreigner to demonstrate how grateful I was to be accepted at the monastery as a candidate by learning the rituals well. The vital moments of ordination ritual, which we memorized, were spoken as short phrases after the master intoned them. Unfortunately two days before ordination we learned that the main ordaining nun did not speak Mandarin so Taiwanese would be used in the nun’s assembly. This meant that to my ears the questions would be incomprehensible and still the Mandarin responses had to be memorized perfectly because the eyes of all the Abbesses would be examining us. So, because we were tall, I and two foreigners along with our Taiwanese team leader, formed the first group of four nuns to be ordained. We walked into the glorious assembly of Abbesses who had been chosen for their exemplary practice, some of whom had been ordained for perhaps 70 years. We unfolded our prayer mats, prostrated perfectly wearing layers of long slippery robes, carrying begging bowls and responding all the while in Chinese, Achi must have been at my side! During our stay at the monastery, I was continually touched by the kindness of the Abbot. Hosting an ordination is a giant undertaking. Not only did he care for us like his own children, the 30 esteemed Abbots and 20 Abbesses assembled for the Bhiku/Bhiksuni ordination came from all over Asia, and they were cared for impeccably. Also daily buses of donors came to offer the requisites from food to medicines and they were hosted and fed as well. He personally supervised music training as the long rituals were all sung. When we were tired he encouraged us and when our discipline lapsed he scolded. He told us there was so much Dharma work he saw that needed to be done, that he never rested a day in his life. Before Bhiku/Bhiksuni ordination he gave us all beautiful formal robes, begging bowls, shoes, saying he thought it would be the last ordination he would host and that he hoped that we would all become fine monastics. Finally the nights before each ordination were traditionally filled with prostrations and despite the fact that he had the same flu that flowed through our assembly he stayed and prostrated with us. The last ordeal of ordination was the custom of making an offering of one’s body before taking the Bodhisattva vows. The Chinese tradition is to consider the vow to remove all suffering very seriously by accepting three cones of incense to be burned on one’s head leaving forever three identifying scars. He gave us fearlessness and inspiration so that we understood the compassion and commitment underlying such an offering. As a westerner, most moving to me however was being in a Buddhist national culture. I saw monks and nuns everywhere. Businesses routinely offered discounts and restaurants, meals so that monks and nuns can live by donation in a modern society. As I was journeying towards the monastery in southern Taiwan I kept meeting people who said, “Oh my mom is going down to cook for the gathering”. People came from all over to cook daily for almost 1000 people. There were groups of people who came for days at a time to hold ceremonies to remove all obstacles for us. Visitors gave huge amounts of medicine when they heard us coughing, books, malas and much cheering. Sundays were special, the noontime ritual for receiving offerings was longer and more formal. I would see 7 – 10 huge buses lined up. Crowds came from Temples all over Taiwan to offer the day’s meal to the ordaining Sangha and to encourage their family members. We had 15 minutes after lunch to greet family and teachers. Almost everyone’s teacher came to offer personal support and encouragement. It was such an outpouring of love and appreciation for taking ordination that it brought me to tears each time. So often for westerners it is a difficult decision for our families to understand. It seemed as though monastics were thanked and loved because they wished to live their vows not only by their community but by the nation. The immense generosity I experienced came from the nation, not only the Abbot or Monastery, as everything came from the people who donated. The Abbott trained us to remain thankful and worthy by keeping our vows well, remembering always how difficult it was to receive them and how much Dharma work we were now to devote our lives. Vajra Dakini Nunnery - Peace, Practice, Service - Maine.